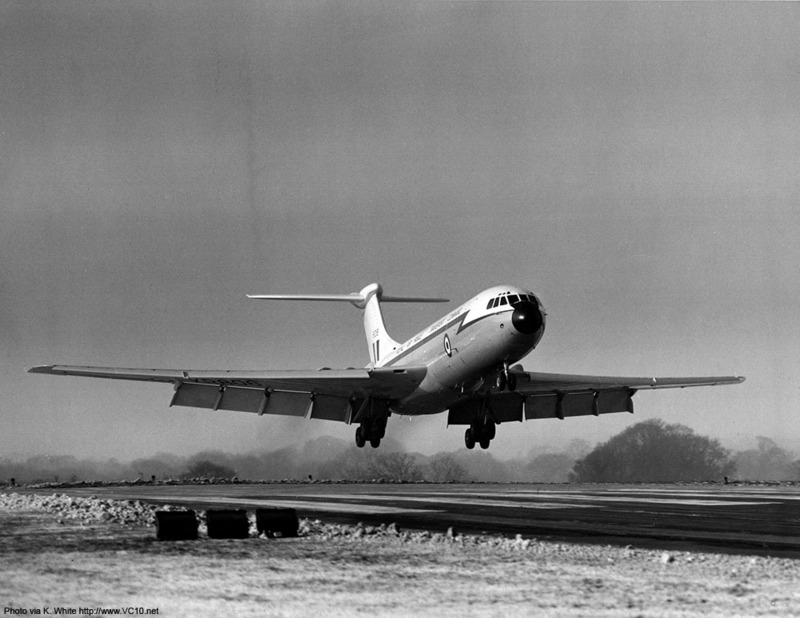 26 November 1965 First flight. 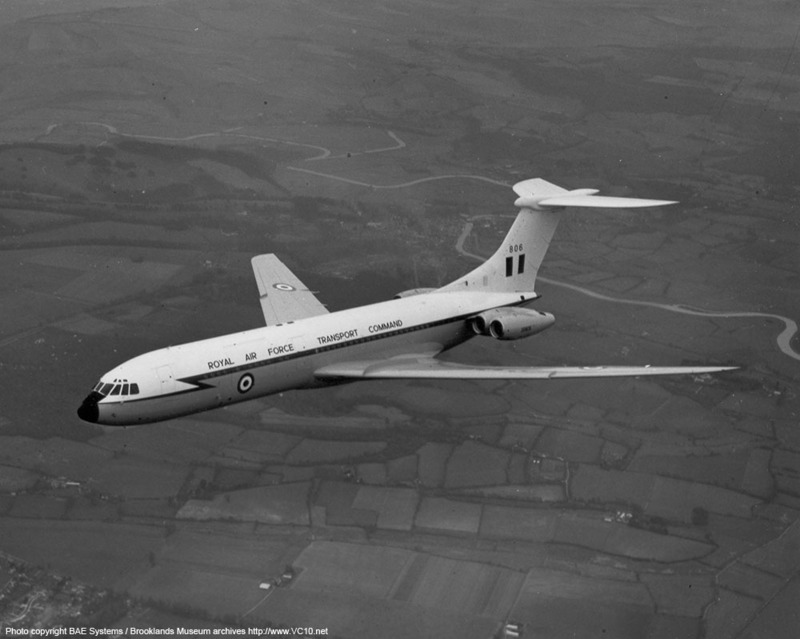 1966 During a RAF training flight the aircraft suffered a seized brake at Stansted, stranding it on a taxiway. 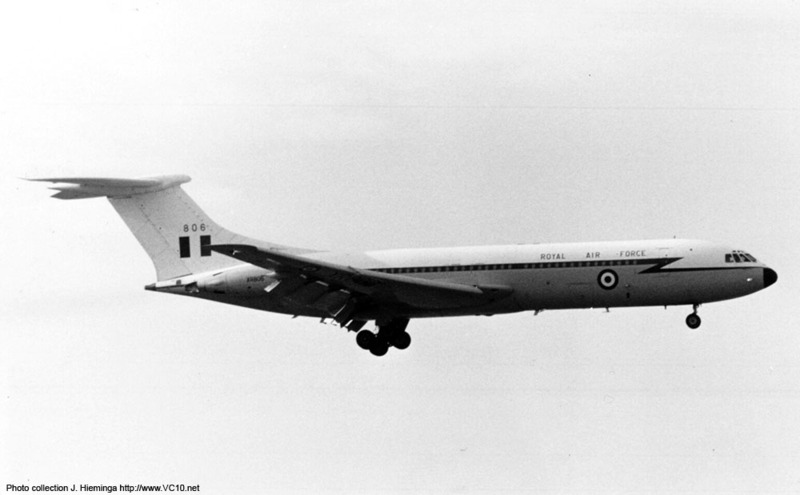 19 April 1967 Delivery to RAF 10 Squadron as XR806. 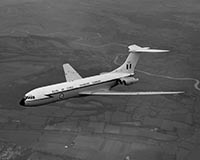 November 1968 Named 'George Thompson VC'. 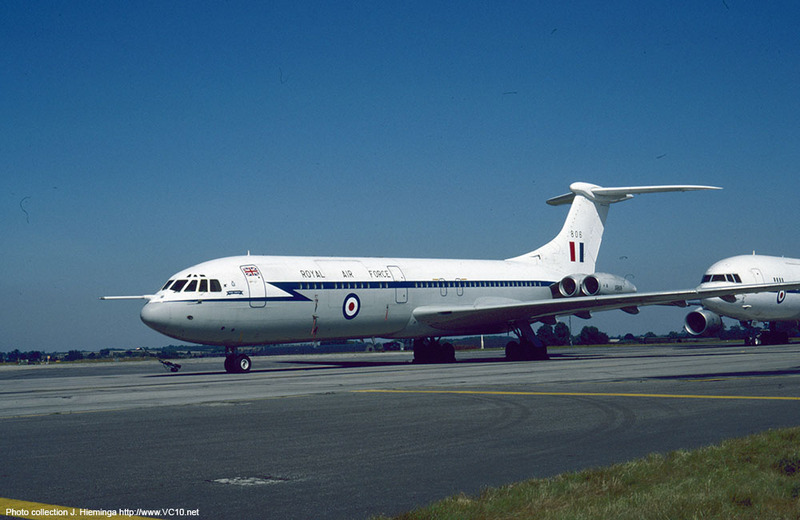 13 September 1980 Flew at the RAF Abingdon airshow. 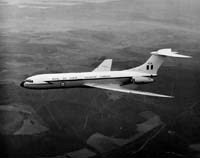 11 November 1982 Flew to RAF Wyton for trial fitting of a modified hangar door for a planned modification program. 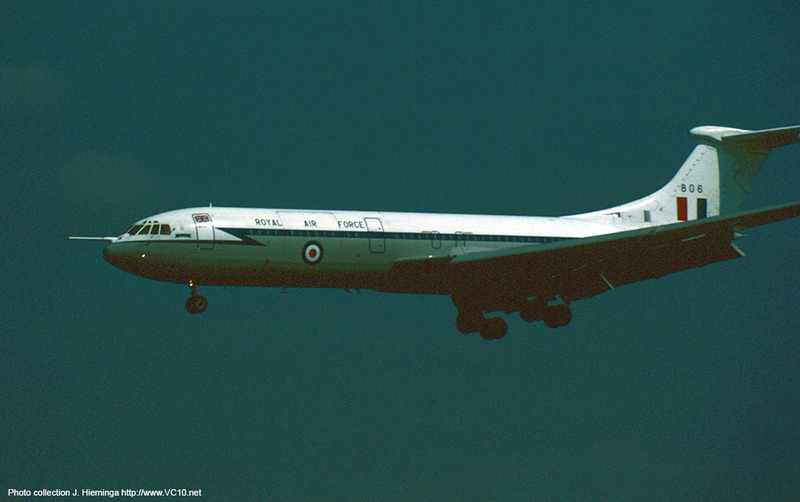 29 Nov 1982 - 1 Dec 1982 At RAF Wyton for avionics modification. 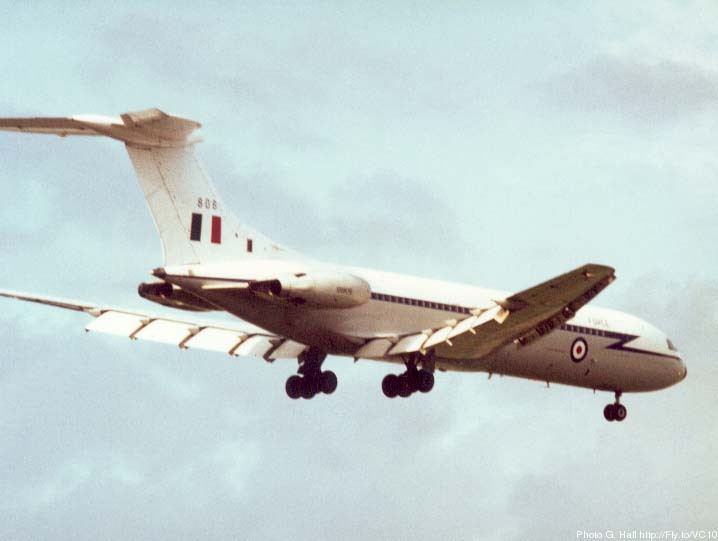 19-22 December 1987 Flew non-stop from Brize to RAF Mount Pleasant and back, setting two records. 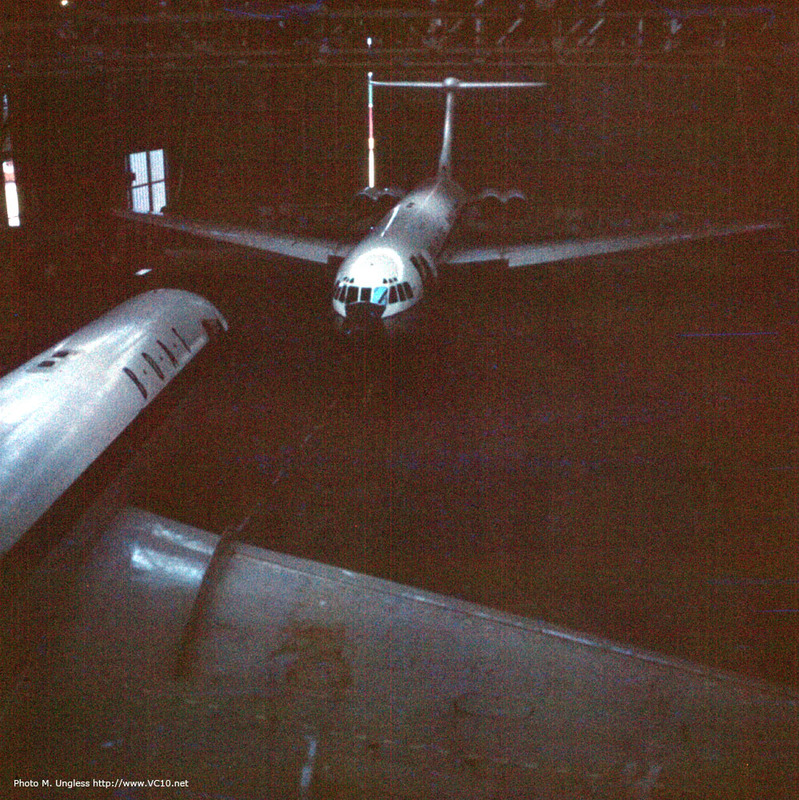 1992 During maintenance at Brize Norton a combination of MEK fumes and a spark causes a flash fire in a wing tank. 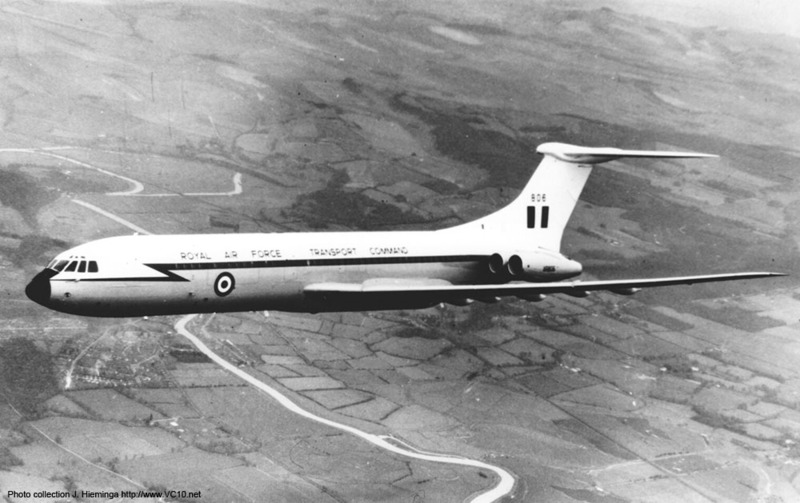 Nobody was injured, only a few shocked faces, and the damage to the aircraft was repaired. 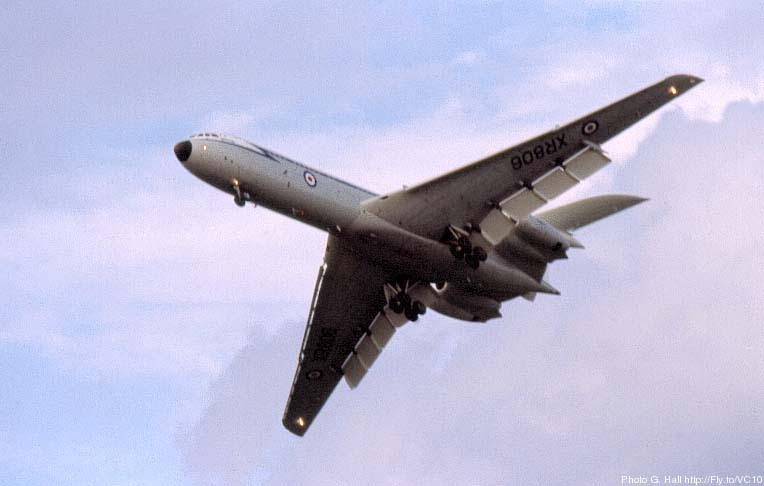 29 November 1995 First flight after conversion to C1K tanker/transport. 23 February 1996 Delivery to 10 Squadron as C1K. 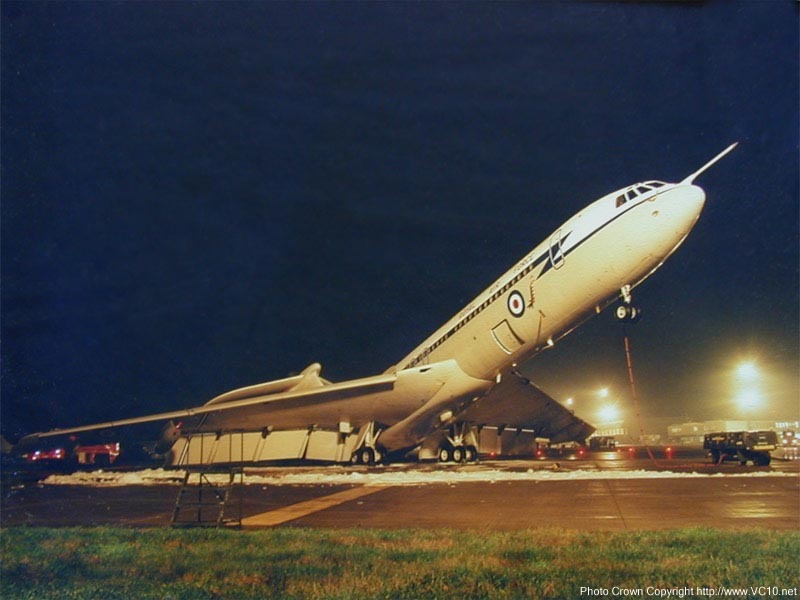 18 December 1997 Tipped onto its tail during a defuelling mishap. September 2009 Fuselage section moved onto the airfield itself for fire training. Remains of forward fuselage scrapped. 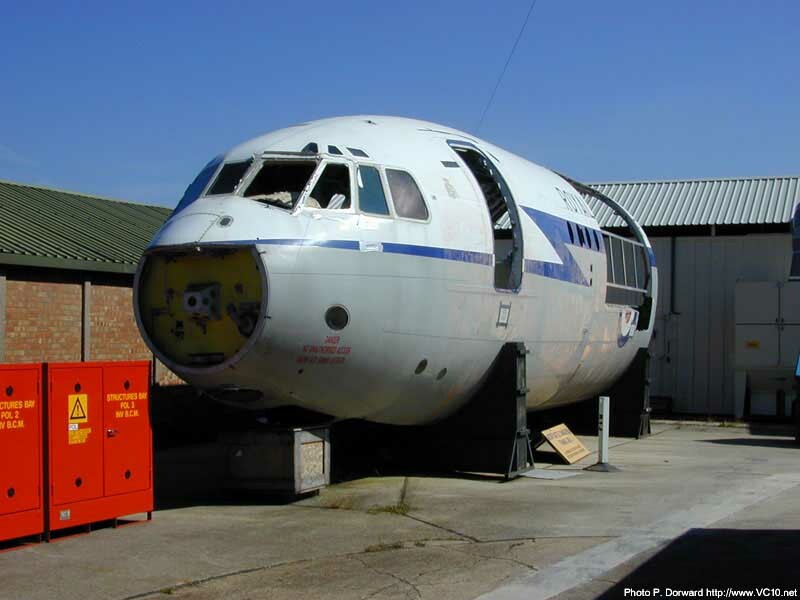 A galley unit and small fuselage panel are in private collections, another small fuselage panel is on display at FAST, Farnborough. 1. 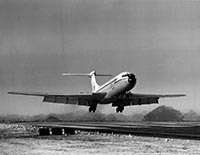 A brand new XR806 is towed towards the runway at Weybridge. 2. During testing, XR806 returns to a wintery Wisley. 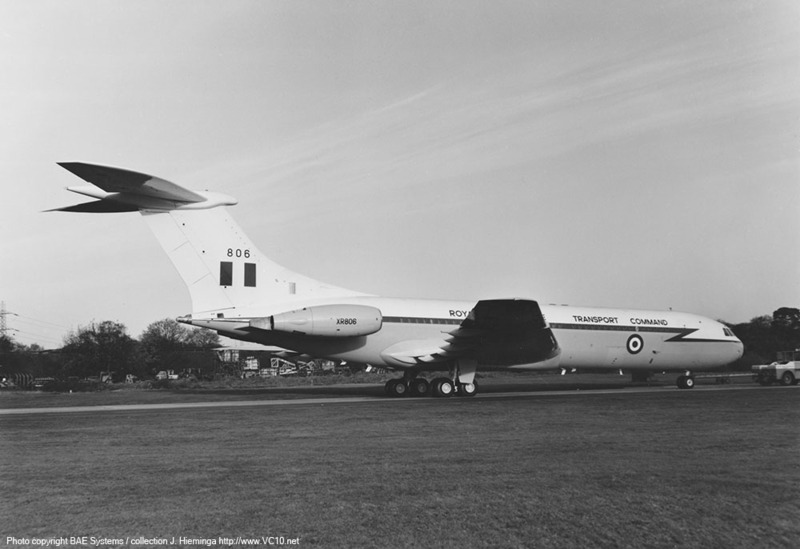 Together with XR807, '806 had to carry out a lot of testing to find out how this 'hybrid' version performed. 3. A BOAC Super VC10 and what is most likely XR806 share one of the hangars at Wisley late in 1965. 4. 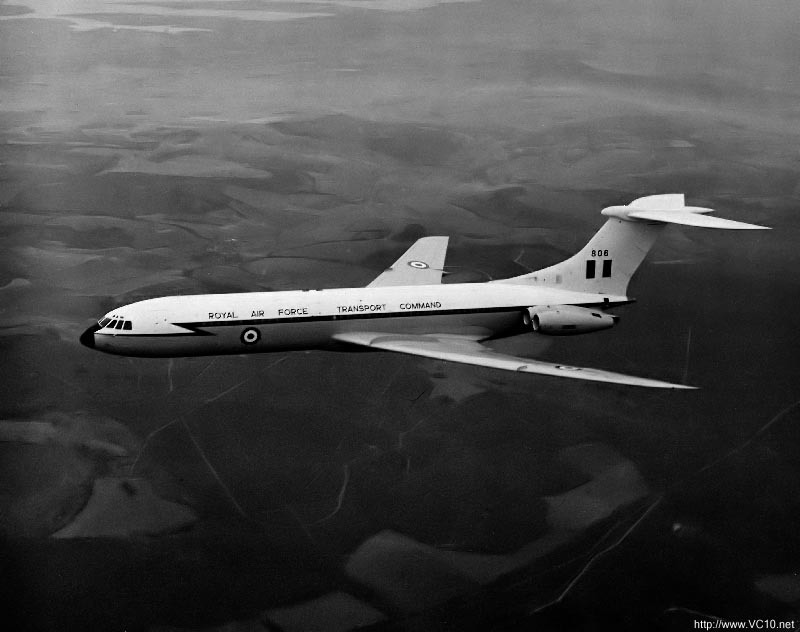 As the first RAF airframe XR806 was the subject of several air-to-air photos. 1-2. 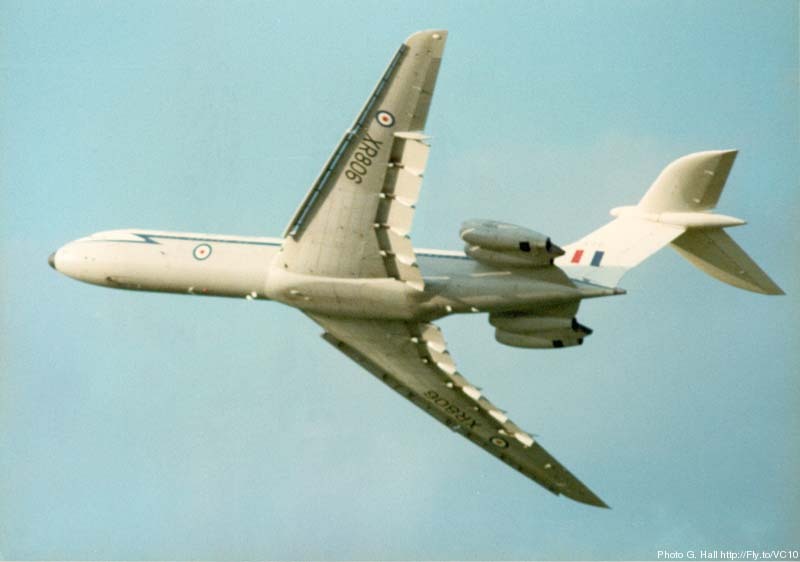 As the first RAF airframe XR806 was the subject of several air-to-air photos. 3. 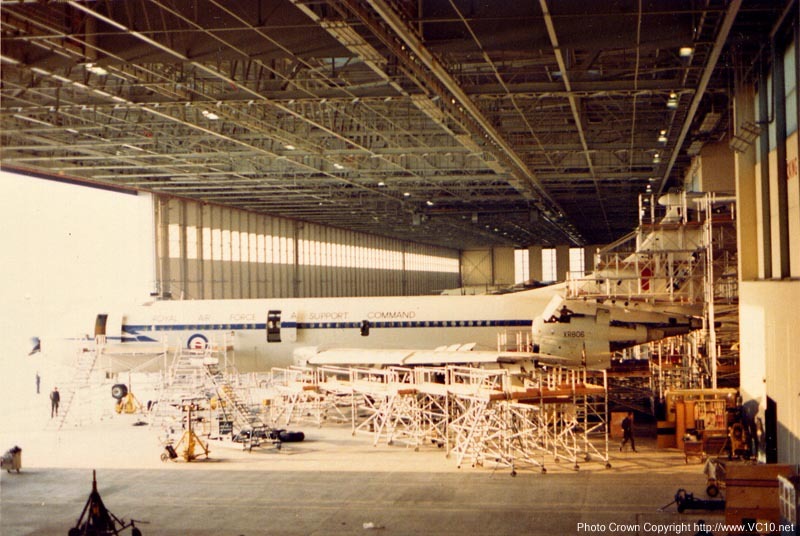 XR806 undergoing maintenance in the hangar at RAF Brize Norton. 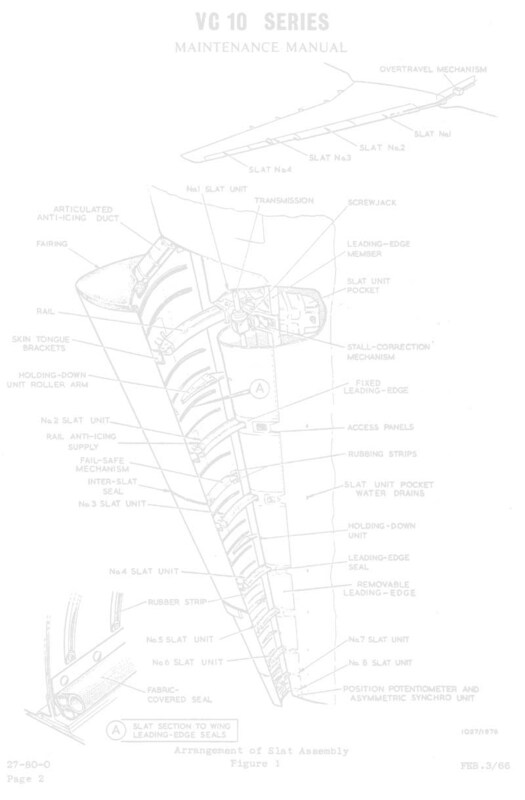 Second version of the fuselage titling. 4. 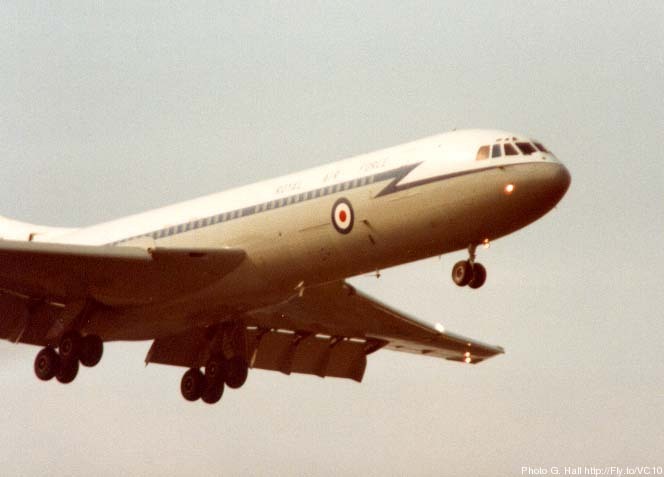 XR806 landing, by this time the titles on the fuselage have changed to just 'Royal Air Force' but the radome is still black. 1-4. In 1980 XR806 performed several flypasts at the airshow at RAF Abingdon. 1. The original scrolls, as seen here during a visit to Belize, were handpainted. 2. 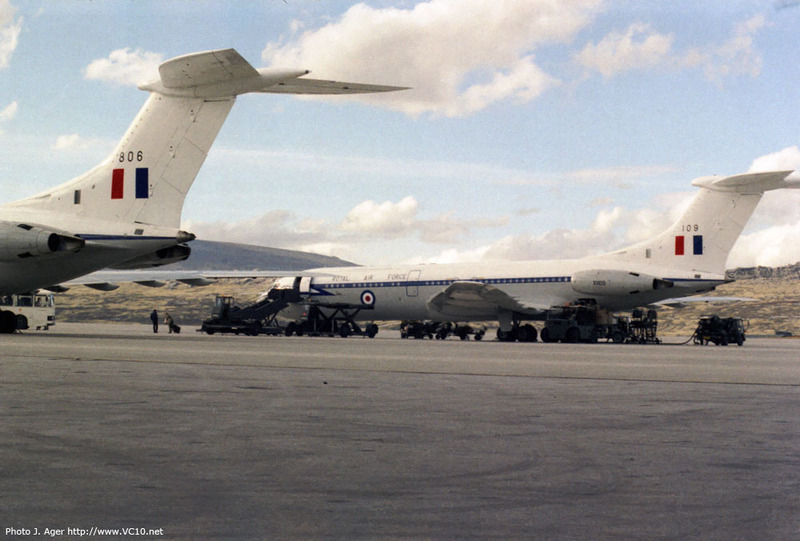 XR806 and XV109 sitting together on the pan at Mount Pleasant airfield in December 1987 during the record flights. 3. A group photo after XR806's arrival at Mount Pleasant. 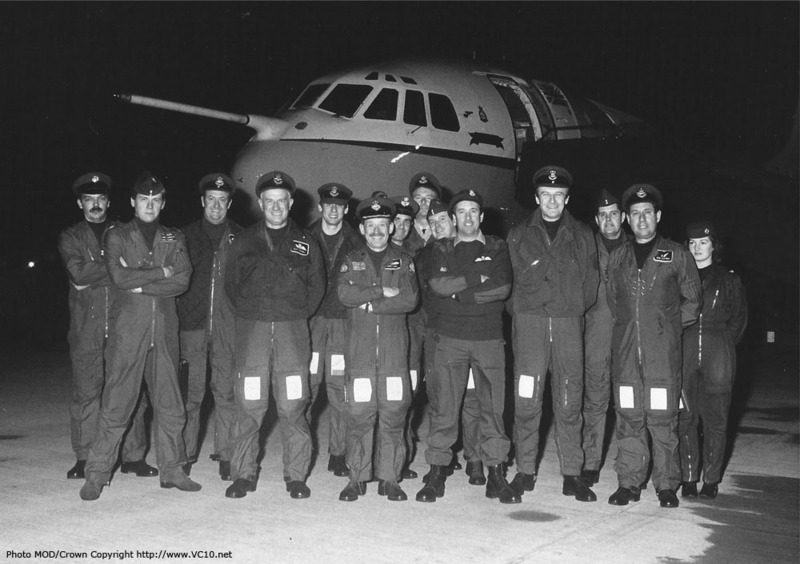 Left to right: GE, GE, Sqn Ldr Cadwallader, Sqn Ldr Barrell (TTF), Fg Off Ager, Gp Capt Lumb, M Eng Steele, Wg Cdr Mike Westwood, M Eng Mackey, Station Commander MPA, Wg Cdr Symes, MALM Emsen, Sqn Ldr Cottrell, Cpl(W) Miles. 4. Another approach photo in what appears to be twilight. 1. 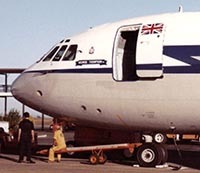 XR806 seen at Brize Norton on 7th September 1991. 2-3. 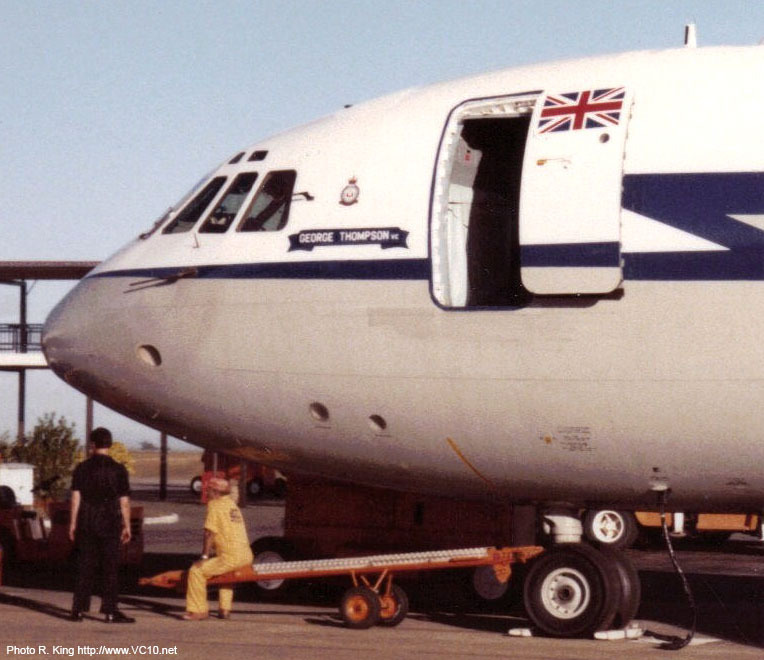 XR806 looking undignified after its defuelling accident. 4. For ten years the forward fuselage was used for battle damage training at Brize.